As far as something simple and effective, I don’t think it gets much simpler than smudging, also known as saging or smoking, a space to rid it of negative energies. 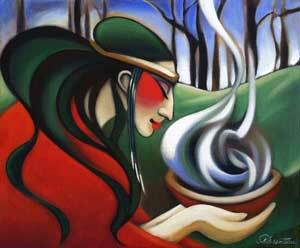 It has been my experience that this is the most well known and most widely used way of smudging. 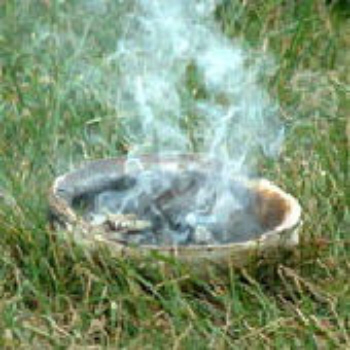 Smudging, or the sacred smoke bowl blessing, is a powerful cleansing technique started by The Native North Americans which actually dates back millennia. Most traditional cultures, including the Zulu, and Chinese, for example, have age old rituals for blessing and cleansing. It is impossible to say for certain when smudging actually began, but early civilation came to know that the smoke from particular herbs had beneficial effects for humanity. Originally mixtures of sacred herbs, as well as resins, were burned in a special bowl and the smoke was then wafted around the person or place that needed purification and cleansing. Eventually it was found to be simpler to bind dried herbs together either with colored string, or a strip of hide to provide an easier way of smudging. In addition to cleansing and purifying, the Native North Americans see smudging as a way of shifting between various levels of reality, connecting us here in the material, physical world to the subtle spirit realm. Emotional cleansing (after arguments and in relationship rituals): Sage, cedar, lavender, and borage which is optional. Mental clearing mix for clarity: Rosemary, juniper, pure tobacco, sweetgrass. Healing of mind and body: sage, cedar, lavender, and echinacea which is optional. The recipes are limited only by your imagination. When making mixtures for particular uses and ritual the general concensus is that it is far easier and convenient to mix dried herbs in whatever desired ratio that is most pleasing to you. It is best to use a charcoal block and then add the mixture a pinch at a time to keep a strong and continuous smoke going, rather than putting in a large amount which omly burns what is in direct contact with the charcoal and you then have to stop and try to scoop it up to re-add it. One thing that is definetly worth mentioning is that you can use culinary sage if need be. You can then use your mixture in whatever ritual you have chosen for the issue at hand. There are several good, reasonably inexpensive books available regarding smudging. My personal favorite is: The Smudgings and Blessings Book by Jane Alexander. The reason I favor this book is it is extremely informative about the Native American beliefs, it gets into how they view the quarters and what each direction represents to them. In addition to a super enlightening section on that, she then moves on to the Wheel of the Year and our Sabbats, so their is a great deal one can learn on multiple subjects that would be of interest to anyone interested in both the Wiccan religion, as well as getting some education on another pagan belief system. The other book I have personal knowledge of is : Sacred Smoke by Harvest McCampbell, this book was given a very high rating by a good friend, but I myself have not read it. There is also a web site: Weloveincense.com, which gets into smudging as well. My first personal contact with smudging was about 25 years ago in a strictly Native American setting, but I integrated it into my personal life very quickly with always positive results. One other thing worth mentioning is that in my researching smudging I have seen it said in the Wiccan context that after a person smudges to remove negativity, you should then burn incense of your choice due to the belief that removing the negativity from a space leaves a vacuum. I have never subscribed to this philosophy due to the fact that I always use sweetgrass in whatever blend I make because it attracts positive energy to the space, but I felt this was definitely worth mentioning in my attempt to share information and educate. Brightest Blessings! As energetic beings a lot of what we do, what we feel, need, want and so forth are governed by electrical impulses we direct within ourselves. The purpose of which is to create energetic responses which provides us with a sensation or seemingly emotional response. This transaction that occurs on an unconscious and ethereal level impacts everything external to ourselves. We do this in milliseconds every day without ever stopping to think or even contemplate about this. It is something that simply happens. In addition to this is our ethereal self, the many layers (for the purpose of this article the context of ethereal is in terms of aura) of our aura that vibrates from us responds to these impulses. Be it the mentality of cause and effect or the line of communication internally and externally derived and combined. Consider when you are feeling down, sad, upset or otherwise how small you feel. It is as though you are carrying the world on your shoulders. In comparison to when you are happy, excited and feeling confident. Consider how big you feel, the sensation that is flowing through you and it is as though you are going to explode in the best possible way; it is that incredible. This is a vague example of how powerful when aligned the connection is and the impact this can have on us. To this take this one step further, consider that you can, have and do control this process. Irrelevant of what is happening around you, you have the power to respond in any way that you would like. With this said that does not mean that this is always in a perfect state. Whilst we aim and strive for this, we can find that heavy feeling sticking around a little too often. This is because, on occasion, this communication can become blurred due to your ethereal layers being what I call ‘dirty’, or blocked. This can then be absorbed internally and externally into the physical. (Whilst this part of ourselves is extremely detailed, this article is one very small aspect of what happens). What I mean by this is that we have a tendency to pick up other energies, whether we realise it or not. This can be positive and negative. In addition to this we can also take on the traits of these energies which may include negative thought patterns or illnesses. If this wasn’t enough as easily as we can pick up energies so too can others; we can have our energy taken from us from someone else. Keeping in mind this is rarely done consciously and with malice, it is a survival mechanism. To keep yourself balanced, in check and feeling like yourself, include regular cleansing into your daily routine. Be it chakra balancing, ethereal cleansing, meditation on all parts or simply using white sage. There are numerous methodologies to assist with this and it comes down to what is right for you in that moment. The purpose of this is to ensure that what you feel, the emotion that you experience is yours and holds the intent of your purpose rather than being a blurred version and interpretation. Each day we pick up gunk in our aura from others by simply passing them in a crowded market or speaking with an upset friend on the phone. This is then added to the gunk we accumulate from our own toil and trouble. This gunk then gets sucked in to the constantly spinning energy wheels in our aura that we all know as our Chakras. I will explain here, how to clean your own chakras when you don’t have a healer of any sort about to do it for you. For the sake of brevity, I’m only going to run through the main 7 in this short article. All the myriads of others, however, can be taken care of in much the same way with a few adaptations that you can easily make yourself before beginning your own self cleansing. You’ll need a quartz crystal, (Any type will do as long as the energy feels right) a relaxing place to sit or lie down, and some soothing music unless you simply choose to relax to the sound of silence. Start out by sitting or lying for a few minutes in your place of choice. Become aware of your body. Then place your quartz on your first chakra, also known as the root chakra. This chakra is at the base of your spine, and is red in color. This first chakra is responsible for grounding, being centered, and survival. Picture the constantly spinning wheel that is your chakra opening wider to allow the quartz to pull out and cleanse away all the dirty and negative gunk from it that has been bogging you down. Now picture the quartz bringing a clean, healing, red light down from the universe into itself, and finally in to your first chakra. While you see and feel this light filling your first chakra make this affirmation to yourself aloud or in your mind. "I am properly grounded and centered in my universe as I grow and thrive on my path." "I am a creative and sexual being." "I let go of all that is bad for my well being." "I make my choices with wisdom and love." "I speak the truth with love and clarity." "My inner sight guides me on my path." Move your quartz now to rest on the top of your head where your crown chakra is located. This chakra is white, and serves as your connection to your higher self, the universal energy, and your spirit guides. When this chakra wheel opens for the cleansing, become fully aware of your deepest and highest self. Become fully aware of the greatness of the universe that surrounds you. Become fully aware of all your wonderful, powerful, and loving spirit guides who teach and protect you. Feel yourself coming closer to all of these beautiful truths as your quartz cleanses this chakra of any blockages and gunk that may be in your way to a higher enlightenment. Then feel the quartz pulling down universal white light to lift and fill you with pure, clean, knowledge and love. Allow the cleansing of the gunk and then the depositing of the healing light in each chakra to take as long as you feel it needs to take. Don’t rush. Some chakras may be easier to clean than others, depending on what is going on in your life at the time of each cleansing. Do this often, for our aura is as much a part of us as our body is, and it needs its shower/bath as well. When you’ve finished the cleansing, be still and relax for a few minutes before getting up slowly to have a refreshing glass of water. You should feel light of body and in happy spirits for several days after a good cleansing. Now that you’re all clean, though, don’t forget about the crystal that helped you in that process. It has worked hard and needs to be cleansed as well. There are many ways to do this, so I always tell people to use what ever method feels right to them. You’ll know if your quartz feels properly free of gunk after you’ve cleaned it. If it doesn’t, try something else. Some people put their quartz in the sun to cleanse. Others submerge it in a dish of salt water. I simply run mine under cool running tap water for about sixty seconds, and picture all gunk flowing out of it and down the drain. Then if it isn’t perfectly happy, I hold it in my hand for a while and give it healing energy and white light. That usually does the trick. Some of these methods may work for you or you may invent your own. There is no right or wrong way, as each quartz is unique.